The Comrades of the Great War was formed in 1917 as a non-political association to represent the rights of ex-service men and women who had served or had been discharged from service during The Great War 1914-1918. Comrades of the Great War was one of the original four ex-service associations that amalgamated on Sunday 15 May 1921 to form The British Legion. 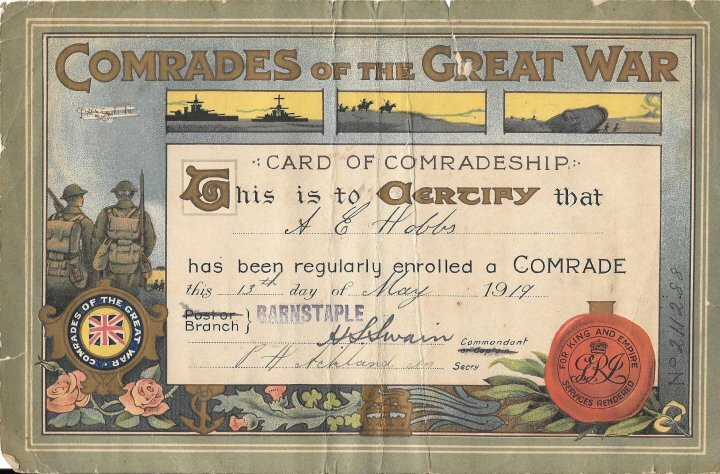 This certificate was issued for Alfred Edward Hobbs of Pilton. He had served in the 1st/6th Devonshire Regiment. Based in Barnstaple, the 6th Devons specifically recruited men from North Devon. We are not aware of exactly where Alfred served, although we have a photograph of him in Deolali, India in 1915 which is being posted elsewhere on this archive. Many thanks to Gary Rennles who sent The Pilton Story this photograph.